The urinary system plays a vital role in the body’s ability to maintain volume and composition of body fluids within normal limits. One of the main functions of the urinary system is to rid the body of waste products such as urea. The urinary system’s major organs include the bladder and the kidneys. While the urinary system is the most involve in excretion, other organs such as the lungs, skin, liver and intestines are also involved in excretion. The lungs remove carbon dioxide and water as waste products, while the skin’s sweat glands also rid the body of waste. The liver and intestines excrete the bile that results when hemoglobin is broken down. The urinary system also maintains fluid levels in the body and pH of blood. The system makes sure that there are normal concentrations of electrolytes and other substances in the blood by filtering blood through the kidneys. In general, the urinary system maintains homeostasis in the body. Malnutrition lowers the body’s ability to regenerate cells and work efficiently. Malnutrition can lead to a decreased resistance to bacteria which can cause UTIs in children. In a study done by the University of Maiduguri Teaching Hospital, children who were malnourished were found to be more likely to develop urinary tract infections. The bacteria that exit our bodies have a much easier time causing infection when the body’s defenses are depleted as they are when someone is malnourished. Another study by a German institute found that malnutrition can cause worsening of chronic renal failure symptoms, and CKD can also cause Protein malnutrition. Overall, malnutrition can cause the body to stop functioning properly, thus harming organ systems. In reference to the urinary system specifically, malnutrition can cause the kidneys to stop filtering the blood properly. First, if the body is not hydrated enough, then the kidneys must work harder to preserve fluid, while still attempting to excrete waste. Also, if there are too many bodily processes going on, such as in the case of a very obese individual, the kidneys will have to work harder to filter much more waste out of the blood. Thus with the kidneys working faster, they will not be able to filter out nearly as much waste. Click here to learn more about kidneys! 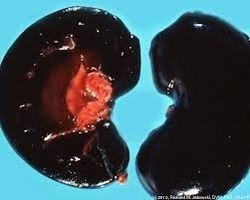 A picture of diseased kidneys that can lead to Chronic Kidney Disease, or Renal Failure. Type II Diabetes is a metabolic disorder that is a result of the body building up a resistance to insulin produced by the body’s endocrine system. As a result, the blood has excess glucose that is filtered by the kidneys. Some of this excess glucose is filtered out of the blood by the kidneys, leaving the body through urine. So, doctors can use the smell parameter of a urinalysis to diagnose diabetes, or at least run further testing, because patients with diabetes have sugary smelling urine. Also, the glucose attracts bacterium and creates an ideal growing environment for bacteria in the urinary tract, thus diabetics have a higher prevalence of urinary tract infections. The diagram shows why there is glucose in the urine. Due to an increased glucose load, and glucose saturation in the blood, there is low glucose reabsorption by the body, thus there is glucose in the urine. Also, to properly filter the blood, the kidney must use more water, thus a person with diabetes tends to urinate often and feels very thirsty. Another reason for the UTI and various Kidney problems that accompany diabetes is that the blood in a diabetic is more viscous due to the glucose so moves slowly through the body. So, when there is an infection and blood flow is not strong enough, the infection cannot be dealt with properly. Also, when blood is not flowing to the organs properly, the cells do not regenerate and function properly. Thus, people with diabetes have a greater chance of renal failure and chronic kidney disease.